I have been working in Ontario on hepatitis C education, awareness and knowledge exchange with immigrants and newcomers for more than five years. My professional focus on hepatitis C in Canada started shortly after my own arrival to Canada from Pakistan, where hepatitis C is very prevalent. I am thrilled that Canadian immigrants and newcomers are being included in future elimination efforts. We need to make sure that the needs of this priority population are addressed at every level of the cascade of care. Canadian immigrants and newcomers are an important, and often hidden, key population in Canada’s hepatitis C epidemic. There has not been sufficient recognition of Canadian immigrants as a priority population at risk for hepatitis C and they are often missed in provincial and national debates and planning. The Canadian immigrant population is significant and will continue to grow: according to the 2016 census, one in five Canadians is foreign-born, and in Ontario alone, nearly 30% of the population is foreign-born. The primary source countries for immigration to Canada are China, India, Pakistan and the Philippines, all of which have large numbers of people living with hepatitis C.
There is enough epidemiological information to suggest that Canadian immigrants are disproportionately affected by hepatitis C. According to data from the Public Health Agency of Canada, immigrants and newcomers represent 35% of all current or past infections in Canada and hepatitis C prevalence in Canadian immigrants is approximately two-fold higher than Canada’s overall national prevalence. But in the work that I do, I am most aware of the unique factors that immigrants and newcomers face when they need to access screening and linkage to care. Canadian newcomers use the healthcare system sporadically, some even waiting until a health matter becomes acute before seeking care. For those who do access care, many fall through the cracks and are often missed by risk-based screening. From a recent study in Quebec, we discovered that immigrants were not diagnosed with hepatitis C until an average of 10 years after arrival. Part of the problem stems from the fact that many immigrants and newcomers do not have a family physician. A lot of Canadian immigrants and newcomers get their care either from walk-in clinics or from hospital emergency rooms. Their lack of access to primary healthcare is a major hurdle in the way of getting them tested and treated for hepatitis C, because most people are screened for hepatitis C and linked to care in primary healthcare settings. Add to this the cultural and language barriers faced by immigrants in accessing health information and services, and the fact that some are non-status or undocumented and may not access services due to the fear of deportation or being punished for their immigration status. Taking into account all these barriers, it is understandable that there is a problem! But there are solutions out there. While most public drug plans in Canada have relaxed their eligibility rules for hepatitis C treatments, there is still a long way to go in expanding scale-up and access to new direct-acting antiviral (DAA) treatments. Integrating hepatitis C treatment into multi-disciplinary community-based settings for immigrants and newcomers is strongly recommended. The specialist model often fails to offer wrap-around services that immigrants and newcomers need. They need psycho-social supports, like mental health and housing services, to stay on treatment and to deal with the immigration and settlement related stress. This could include language interpretation services in community-based settings and other settings offering care. The CanHepC blueprint offers a lot of hope and optimism to people working in hepatitis C with immigrants and newcomers. When it becomes available, provincial and territorial governments will have to step up their efforts in developing their own elimination plans. We will need tailored, population-specific plans, focused on screening and linkage to care, that make care more accessible to immigrants and newcomers. Making hepatitis C information and referral part of the standard newcomer primary health screening will also be a first step. Currently, there is not a standard newcomer primary health screening process. It is difficult to expect that all newcomers who need hepatitis C testing, treatment and linkage to care will receive screening through existing channels. There is also a lot of work to be done in educating health practitioners: we need to increase the knowledge and awareness of frontline workers and primary healthcare providers about the prevalence of hepatitis C in Canadian immigrants and newcomers, for early detection and treatment to happen. The landscape of my work has shifted dramatically in these past few years and there is a lot of enthusiasm about the highly effective DAAs, the lifting of treatment restrictions and the soon-to-be-released national blueprint. Elimination is within our grasp, but only with an explicit focus on immigrant and newcomer health and a tailored approach. 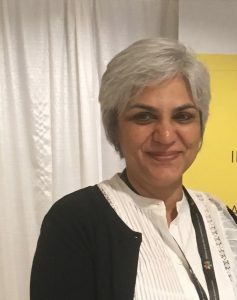 Fozia Tanveer is the manager of immigrant and newcomer hepatitis C community health programming at CATIE. She holds a master’s degree in development studies from the School of Oriental and African Studies, University of London. Hello Miss Fozia Tanveer. This is Muhammad Idrees Khan Hepatitis C Project Coordinator with Sioux Lookout First Nation Health Authority. I 100 percent agreed with your analysis on Hep C in immigrants. These people need to look because in these countries (China, India, Pakistan, Bangladesh, Philippines) a lot of medical malpractices are still existing which increased the probability of Hep C infection.